2008 was a HUGE success for the 18 Wheels program ! The generousity of Albertans really shined through and our Food Banks are extremely grateful. In these tough times, there are many people who require a little extra help to make the holidays a cheerful time. Thanks to our sponsors and donors, we helped make this a little more possible. 18 WHEELS OF CHRISTMAS could not have done this without the generous contributions of these companies and individuals. Thank you. And perhaps most importantly, we want to thank the public at large who continue to support and further this great cause through your donations of non-perishable food items and financial contributions wherever you see an 18 Wheels of Christmas collection point. Calgary Comes out as Champions! Way to go Calgary!!! 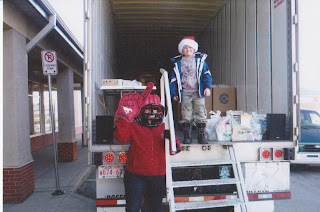 The 2008 18 Wheels of Christmas campaign was a huge success. The numbers are in and Calgary’s team and donors raised an astonishing $101,968.00 of food and cash donations. Because of the support of our donors we were able to assist the Christmas Food Drive in reaching a goal of more than $883,000. We sure did not think we would achieve even a fraction of this. Our launch date was October 2, interest and donations trickle in from that date onwards and our anticipation starts to dwindle. Our 2 very special ladies Vyetta and Bev always lift our spirits by setting the dates they want the 18 Wheels trailer and team at 2 locations. The Lake Bonavista Promenade and the Douglas Square Sobey’s. Again this year we would be doing the Grey Cup weekend we had so much fun last year we were pumped to be doing this date again. November 22nd we started at 9:30 AM at Lake Bonavista Promenade. The residents of this community are always supportive and generous of our venture and the need we are trying to fill. From the time the doors to Safeway opened until our 1 o’clock end time it was a steady stream of shoppers and donations. One lady went in for a jug of milk and brought out a shopping cart full of groceries for the trailer thanking us for what we are doing, grabbing her jug of milk, hugging Santa off she went to continue her busy day. This would be repeated during our 3 ½ hour stint time and time again. On this day we were able to fill 11 skids with food. Grey Cup Day November 23 not only did Calgary bring home the Cup, 18 Wheels of Christmas was a huge winner too from our 3 ½ hours at the Douglas Square Sobey’s. The generosity of this community cleaned out the pre-packaged food hamper bags. There were many shoppers purchasing Grey Cup Party items but this did not stop them from donating. We packed up the trailer with 7 more skids of food. A trend we noticed at both these locations were the families with their children normally we saw the adults bring the donations over but this year the parents stood back while the children brought the donations. It solidified for us that giving is not dead. Nothing happened for Calgary until the 2nd week of December. The trailer was already on its way for Edmonton to work their magic and we feared we would not be able to compete what with the hype coming from Ken, Jodi and Justin the Edmonton 18 Wheels of Christmas Team. While both the 18 Wheels of Christmas trailers were in Edmonton we certainly did not let that stop us. Our monetary donations started rolling in which meant shopping for Food Bank Wish List items. Also donations from other transportation and support industry started arriving this meant sorting and rewrapping each skid according to food items. Because of the kind donations from all our supporters 18 Wheels was able to deliver to the Mustard Seed Shelter in the Calgary Foothills Industrial area 4 skids of personal toiletry items. When a call came out from the Vibe 98.5 the Mustard Seed was in dire need of turkeys for their annual Toyurkey Drive 18 Wheels was able to give a hand up with 48 turkeys, this would assist in their goal of 200 hampers for families in need. We delivered to the Calgary Interfaith Food Bank on December 19th the 53’ 18 Wheels of Christmas trailer full of food and an envelope for $7,648.00 receipted food. For thousands of people in Calgary putting food on the table is a struggle. Last year nearly 90,000 Calgarians went to the Food Bank to receive emergency hampers. 43% were children. Thanks to all our contributors support children in this city and surrounding areas will not have to go to school without having eaten a proper breakfast. Their parents can go to work with energy and hope, and without stressing what they will put on the table for dinner that night. 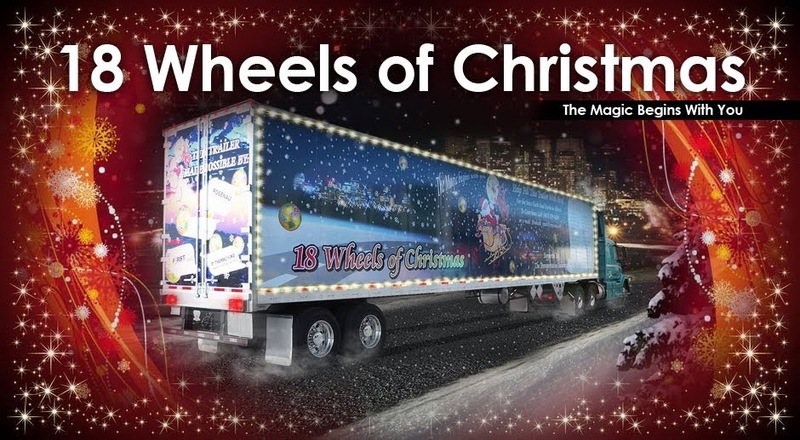 Thank you all for choosing to support the 18 Wheels of Christmas 2008 campaign. Thank you to our strong team of volunteers consisting of management, administrative personnel, professional drivers, warehouse staff and mechanics. Special thanks to our graphics team. Without your dedication and time we could not have achieved the success this campaign has had. We look forward to next year and with all your help we hope to beat 2008’s total. BIG Delivery in Edmonton ! The 18 Wheels Edmonton team pulled into the Edmonton Food Bank on December 16. The team was met by very excited Food Bank staff. Santa Clause himself hauled in a full 53' trailer while his helpers followed closely with a full 48' trailer. 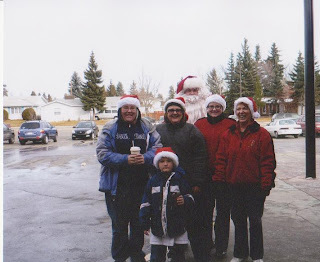 It was Edmonton's second year involved in the 18 Wheels Christmas drive, and it was a HUGE success. We didn't do it alone though, and have to thank many people. First off, we have to thank the entire staff that dedicated their time to this cause. The program was run and organized by Ken Rosenau, Jodi Manning, and Justin Fillier of the Rosenau Edmonton terminal. We also must send a huge thank you out to CISN FM 103.9 and Terry Evans and his crew from the K97 radio station. As well, all the many sponsors that donated food and money. We teamed up with CISN for a day of fundraising at three Sobeys locations in Edmonton. WOW ! Even despite current economic problems, Edmontonians continue to show just how generous and charitable they can be. We would also like to extend our thanks to everyone at Sobeys. Next was a huge event with Terry Evans of the K97 morning show. Terry braved the frigid Edmonton winter and lived in our trailer in support of the food bank. Terry came on the radio every morning urging Edmontonians to donate. He vowed not to get out of the trailer until the food pushed him out..... and he lived up to that promise. Terry filled our trailer with the help of many people, including local firemen and military personnel. On behalf of the Rosenau Edmonton team and the Edmonton Food Bank, thank you to all our sponsors and everyone that donated.